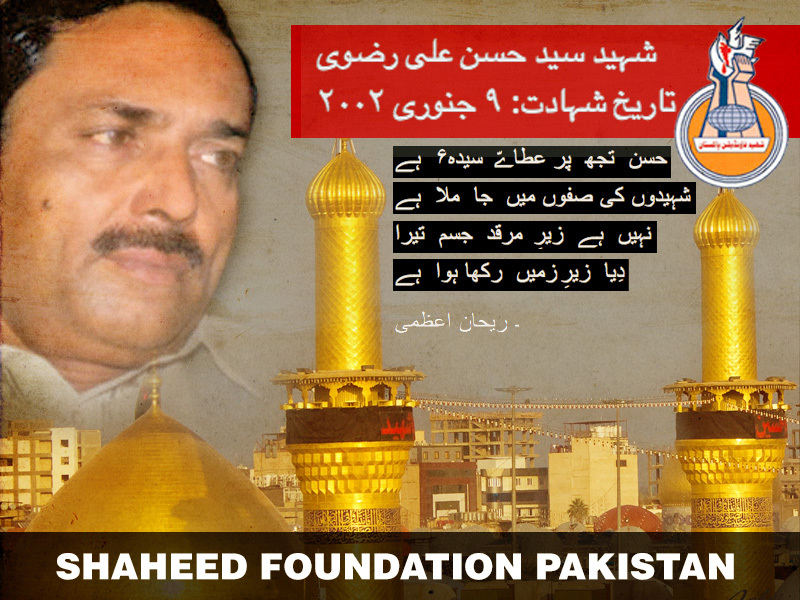 Today marks the Shahadat anniversary of Shaheed Syed Hassan Ali Rizvi . He was shot by terrorists while returning from work and consesquently he embraced martyrdom on this day in 2002. He was serving as Superintendent of Regional Transport Authority, Sindh. He is also known as an active member and an ex-trustee of Anjuman-e-Tanzeem-e-Hussaini .He constantly served MIllat-e-Jaffariya in various ways & presented his life in the path and for the love of Imam Hussain (as). Kindly recite a Surah-e-Fatiha for Shaheed Hasan Ali Rizvi and Shohada-e-Millat-e-Jaffariya Pakistan. Qalam ki aankh se khoun beh raha hai!